We are in full swing of summer now and wow what fantastic weather we have been, so far, lucky to have. The summer months are always a strange time of year in the fitness industry. Although people feel more inclined to exercise with the better weather and lighter evenings there are also summer and school holidays which can upset our routine and exceptionally warm weather can also play its part in affecting our levels of structured physical activity. I have certainly noticed a drop in numbers at our sessions over the last couple of weeks despite the reassurance of shade and water breaks. If you do struggle with the heat then try exercising first thing in the morning or later in the evening. My exercise regime is currently planned in between 7am and 7:30pm out in the garden in the shade and before the kids wake up! Of course there are plenty of activities you can do out in the sun that will help keep your fitness on track such as water sports, walking, cycling and these are great for kids too if you need to keep them entertained and off the electronic devices. 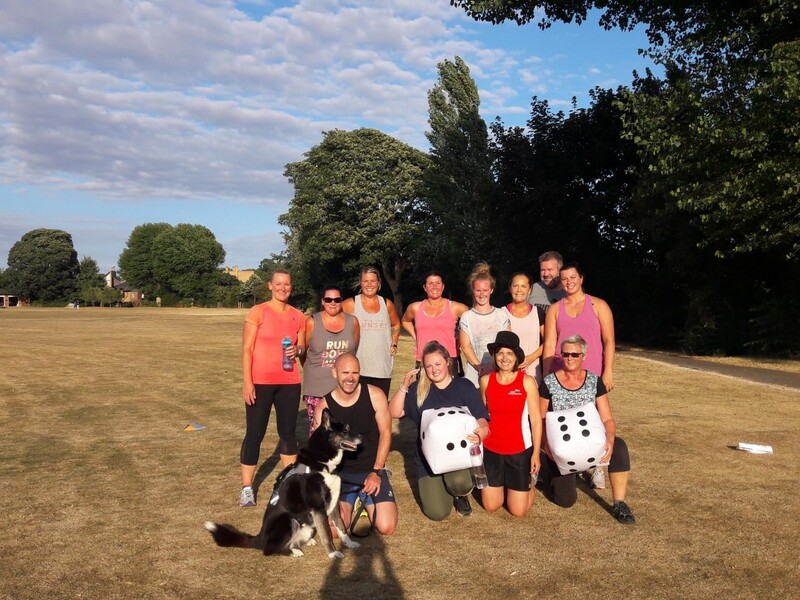 At our classes we have been making the most of using the large space we have available at the parks we use and so have had quite a few sessions revolved around team games such as Bootcamp Monopoly and at our Fareham location we had a demo of Rabble which are all games that incorporate HIIT training without you realising it. Our ethos is to "make fitness fun" and we have certainly been doing that! 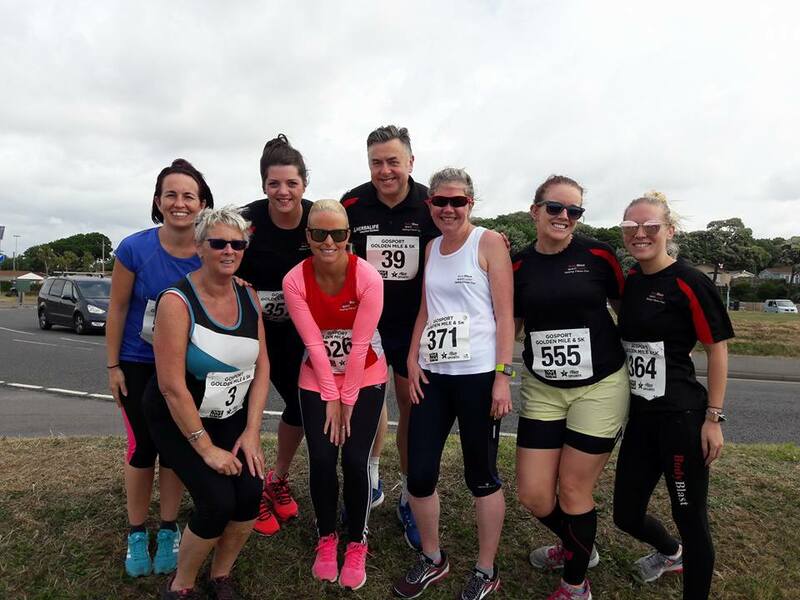 In July a few of our bootcampers took part in local events. The most popular was the Race for Life either the 5K or Pretty Muddy events. 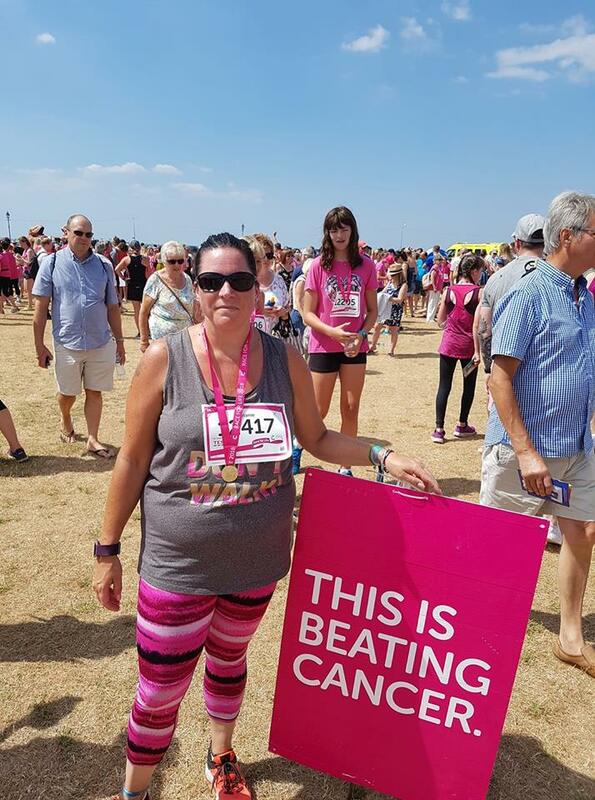 Well done to Lucy, Sam, Mel, Diane and Mandy for taking on the 5K and Sue and Rhian for getting wet and muddy in the Pretty Muddy events. You all did amazingly well considering the very hot conditions. 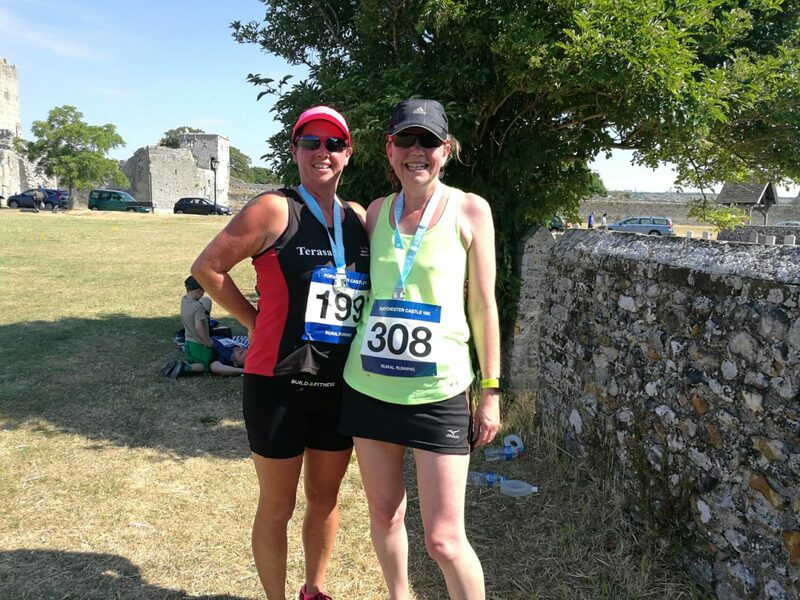 We also had Terasa and Annette run a sweltering Portchester 10K although the firemen and their hoses I think made it worth the heat! 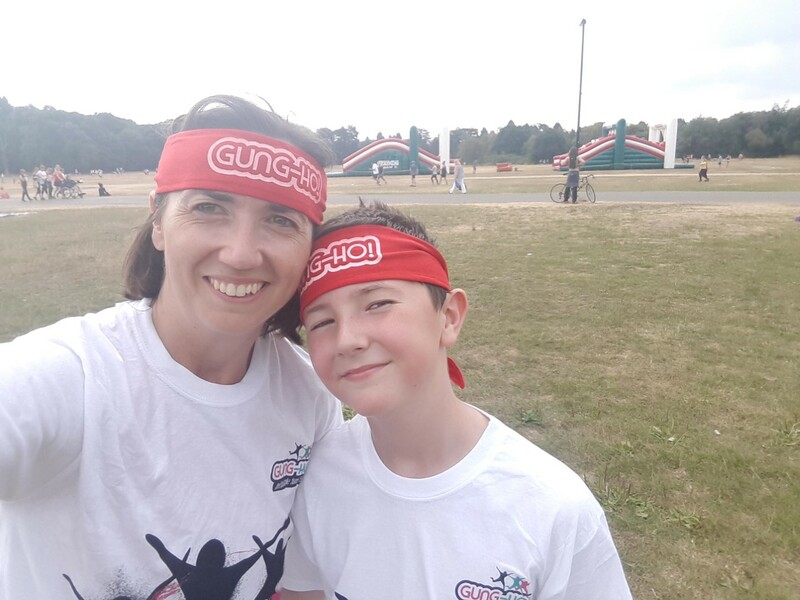 Myself and my son took part in the Southampton 5K Gung Ho course which had lots of big inflatable obstacles to climb over. A great event for all members of the family. So you may think it's too hot to be eating anything remotely spicy at the moment but most hot countries eat spicy food all year round and you can make this as hot or as mild as you like. 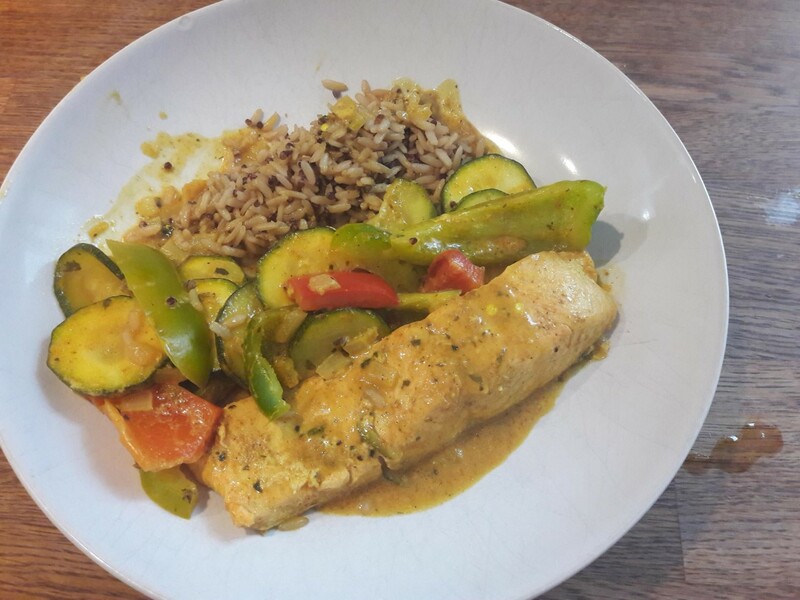 The coconut milk and lime juice give it a lovely refreshing taste and salmon is a great oily fish full of essential fatty acids and protein. Serve with vegetables (eg. courgettes and peppers) and a small portion of wholegrain rice (I used a mix of wholegrain rice and quinoa). Heat the oil and add the red onion. Fry on a medium heat for 10 minutes. Add the curry paste and heat for 1 minute then add the fish and coat with the paste. Add the coconut milk (I used half a tin for 2 servings), bring to the boil then simmer for 5 minutes until the fish is cooked. Squeeze over the lime juice and serve with a sprinkle of the chopped coriander. 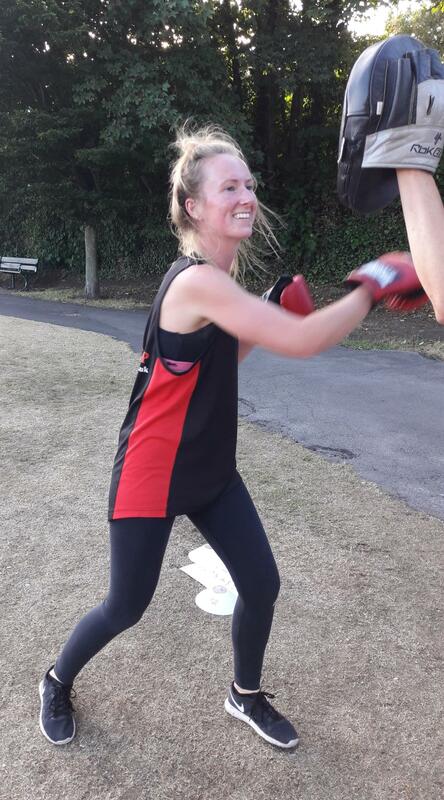 Fran Summers is a regular at our Fareham sessions.Here’s what she has to say about her bootcamp experience. How long have you been attending Bootcamp? I think I’ve been coming to bootcamp for nearly three years now. What's your favourite exercise or piece of equipment to work with? I do enjoy the tyres, it’s hard but feels good when you flip the bu***r! Least favourite probably Metafit as it’s hard in a wimpy way, feel good once it’s done though! What motivates you to come to sessions? Do you prefer summer or winter bootcamps? yourself since coming to Bootcamp? What advice/words of wisdom would you give to somebody new to our classes? Just for fun - if you were a fruit what would you be and why? I would be an apple, because an apple a day keeps the doctor away. Did you know....Underwater swimming is the only time you should hold your breath whilst exercising. The press up or push up is a great bodyweight exercise, not only does it work the muscles in your chest, shoulders and arms but your core works hard to resist gravity pulling you down and to a lesser extent your leg muscles get a good workout too. However many people, particularly beginners, fear the words "press ups" when thrown into a bootcamp session. This is mainly because of the lack of upper body strength people feel they may have however there are lots of variations that you can do to help build you up to doing your first proper press up. 1. Start with a standing wall press up. Put your hands at chest height, slightly wider than shoulder width apart. Lower yourself towards the wall and then push yourself away. The further your legs are away from the wall, the harder it makes it. 2. Use a bench to rest your hands on and do an incline press up. 3. Box press ups - on all fours keep hands slightly wider than shoulders and knees under hips and drop your chest to the floor. 4. 3/4 press up- rest on your knees but lean your hips forward so your thigh is at a 45 degree angle between your hips and knees. Keep your legs uncrossed, head in alignment with your spine and pelvis tucked under. 5. Full press up - keep your whole body in a straight line - you are essentially doing a moving plank. Drop your body almost to the floor before pushing back up. The press up challenge: This month why not give yourself a challenge of practicing a minimum of 10 press ups a day. If you are starting at Step 1 then your aim will be to progress to step 2 within a couple of weeks. If you think you are already at step 4 or 5 then make sure you are actually performing them with correct form! Good luck. Do you have a friend, colleague or family member who might like to try one of our sessions? Word of mouth is always a great way to grow members and as a thank-you to those that bring their friends along who subsequently sign up this will be recognised through a reward scheme. If you refer a friend and they sign up to a monthly subscription you will receive a £20 or £40 voucher depending on which package they sign up to. Rewards will be given after three months have passed and only if both you and your friend are still bootcamp members. Ask Karen for more details. Don't forget our end of summer social is Saturday 1st September at Queen Elizabeth Country Park. We have a barbecue area booked from 11am-3pm. This is for all our monthly paying members and their families and by invitation only for those who regularly attend Metafit sessions. BODYBLAST BOOTCAMP 6:30pm MONDAYS Privett Park, GOSPORT, TUESDAYS AND THURSDAYS Bath Lane Recreation Ground, FAREHAM, WEDNESDAYS Portchester castle, PORTCHESTER. A 45 minute outdoor session designed to challenge you whilst still being enjoyable. Suitable for all levels of fitness, ages, shapes and sizes, exercises will vary from team work, to tyre flipping and bodyweight moves. BEGINNERS BOOTCAMP: WEDNESDAY Stokes Bay, GOSPORT 7:30pm. Similar to our usual bootcamp sessions but focussing more on getting exercise form correct before increasing workout intensity. Suitable for anyone who has never exercised or not done so in a while. MUMCAMP 9:30am WEDNESDAY Privett Park, GOSPORT, 9:30am FRIDAY Portchester Castle, PORTCHESTER. A 45 minute session similar to Bootcamp but where you can bring your baby or toddler with you so no need to worry about childcare. METAFIT 7:30pm MONDAY, Bath Lane, FAREHAM, 6:30pm WEDNESDAY Stokes Bay, GOSPORT, 6:15am FRIDAY Pulse Dance Cheer Academy, GOSPORT. This 30 minute High Intensity Interval Training workout (HIIT) incorporates intense periods of work with short recovery segments. This helps to give you maximum intensity whilst maintaining your exercise form. The bonus of this type of training is that it keeps your body burning fat even after you leave. You will finish feeling great. That's all for this month however any updates or info worth sharing that happens before the next newsletter is due will be sent out to keep you up to date.